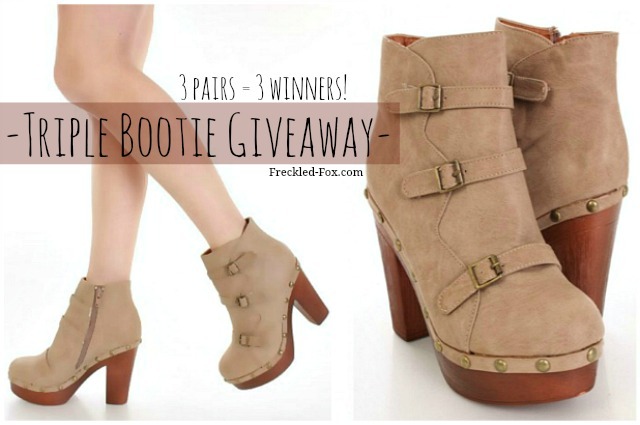 The Freckled Fox: Triple Fall Bootie Giveaway! Hey there ladies (and gents if that applies:)), another giveaway Monday is starting her today because I wanted to give a bit of an apology for all the absence lately with no baby to show for it(come on little one), and since the second best thing to make up for that besides simply posting on a regular basis again is a fab Fall giveaway, I decided I had to go with that. Plus given the opportunity to give away not one but Three pairs of these beauties, how could I turn that down?! I couldn't I tell you. Well anyway's, thank you again for your patience with the inconsistencies here on the blog, and just keep in mind that I'm making plans to jam-pack the blog with that much more posty goodness to make up for it once this little tator tot makes her grand entrance! My favorite thing we've done so far this year is picking pumpkins from the patch out back and gathering leaves and branches from the woods behind our house to decorate the house with. Then we carved and painted pumpkins with the kids and roasted the seeds. We also love going to the fall events at local farms but the weather hasn't been so great this year! I LOVE these!! Thanks for the giveaway! This is worlwide or just for your country? My favorite thing that our family has done so far this fall is attend a local Fall Festival with our 6 month old daughter! I love seeing her play with the pumpkins! And fall plans! :) favorite thing so far was pumpkin-farming it up with my hubs :) oh also! Family portrait seasons! We've done 3 so far and the fall weather has been great so far! I love going to the pumpkin patch with my kids! Makes me feel like a kid all over again. Next up, gorging myself with a huge turkey dinner! These boots are so so cute! Love your blog, redheads have to stick together. :D great giveaway :D thanks! Every time I'm in TJ Maxx, I slowly walk around the boots section drooling over all of the pairs I want. It would be SO nice to win a pair of these... here's hoping! I keep wondering how you're going to post MORE after the baby comes . . . for me it's the other way around, haha. :) My favorite things about fall are the weather, my birthday, and getting ready for the holidays! I love the boots! My favorite fall activity this year has been going apple picking and the the historic Hudson's the Blaze. Seeing all the pumpkin carvings is something else. I love your blog and your family is absolutely beautiful! And these are some really cute shoes! My favorite thing so far this fall was going to a corn maze with my boyfriend! But also walking to classes every morning - the fog and dew with the chill, it's just so breathtaking! Hi Emily! I just recently stumbled upon your blog and I love it! I've been especially enjoying listening to all of the mix tapes you've made, love your musical taste! P.S. these boots are super cute! So far we haven't done a ton of stuff but we have been to a couple of great Halloween parties with wonderful friends! My fall has been swallowed by school. Almost another semester done though. I haven't really had the chance to do a whole lot of fun fall stuff. I'm a student and really busy with school unfortunately. 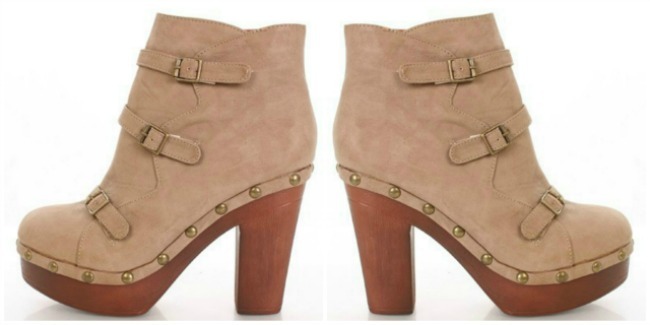 Ankle boots are my FAVE and these are so cute! we have been LOVING fall with our new baby! we've went to apple orchards and punkin patches... 3 times ;) we took a small road trip to lake superior and have been visiting family. trick or treating is just days away! hope your little beeb comes - SOON! Taking my Nana to the pumpkin patch was my favorite thing! I love fall! We go to the pumpkin farm every year with all the nieces & nephews and we had so much fun! We got to pick apples, too! Emily, thanks for the giveaway! We haven't done much fun stuff this year, I am looking forward to have a fire at some of our friends's farm! I'm seeing the musical Flashdance this weekend, which isn't really FALL related, but it's fun!! I am an ankle boot convert. These will be, if I win, my second and most bold pair of ankle boots. Your IG and your preggy pics are the cutest. You inspire me to be as fashionable as you, while carrying a baby! I went to Italy for a weekend! It was soooo amazing! Honestly I am working and have classes all fall, but if i can save enough cash i'll be going home for the holidays! We went to the Pumpkin Walk on Friday. Loved it, my favorite sene was the Pixar one and the Cabbage Patch one. My favorite thing this fall would be carving pumpkins with my husband & decorating our house for Halloween! My favorite thing I've done this fall was to make my daughter her costume, and guess what she is... I'll give you a hint. If she was freckled, it would be perfect! We went to a fair this fall. Tons of fun! I love cooking, baking and wearing tights and skirts ! these shoes are sooo cute. perfect for fall weather. since I'm from vegas, the weather is weird and it's too city. haven't done much. will be going trick or treating and celebrating my brother in law's birthday though. One of my favorite things I have done this fall is a our yearly hayride we take with our family each fall. It is always full of lots of mud and lots of laughs. Hahah this sounds silly, but my fav thing I'd done so far is go to the state fair and watch the demolition derby! I loooovvveeee the derby! Wine tasting in Northeast, PA with friends! My plans are to cook more, using seasonal produce. I'm buying myself my first onesie very soon! I'll love to wear it during this fall and winter. Who won this giveaway contest hun?